According to a new study released Monday by the National Low Income Housing Coalition (NLIHC), Maryland has the 5th highest cost of housing in the country. 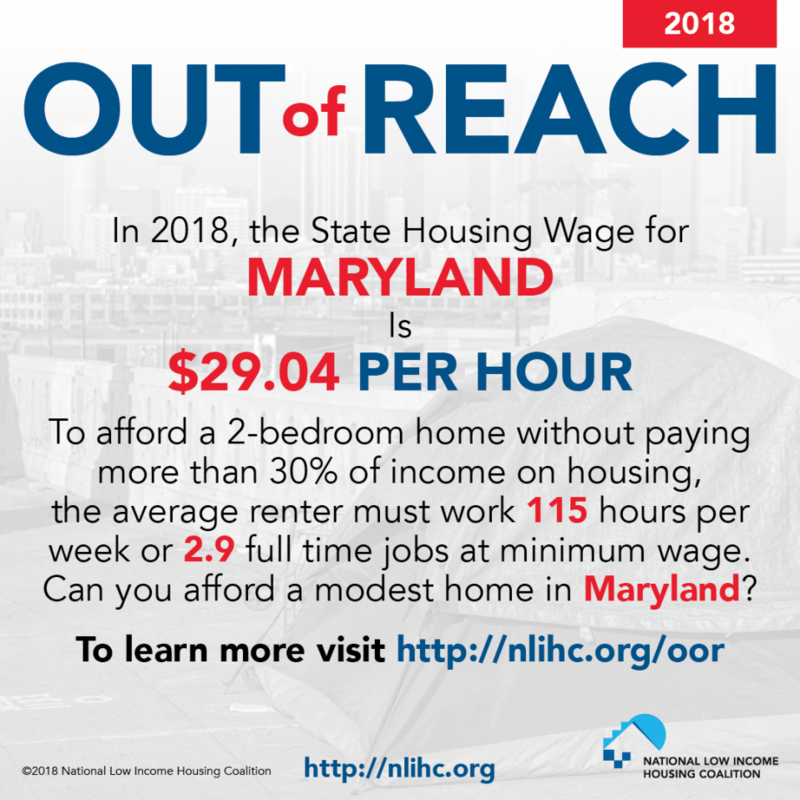 The Out of Reach Study, conducted by NLIHC, concluded that residents in Maryland must earn at least $29.04 an hour for the average two bedroom apartment to be affordable. Housing experts consider that no more than 30% of income should be spent on housing in order for it to be considered affordable. For Maryland residents with disabilities who have not been able to work because of their disability, the affordability crisis is even more severe. Many of these residents earn only $735 a month from Supplemental Security Income. The fair market rent for a one-bedroom apartment in the Baltimore Metropolitan area is $1,125. Without a deeply affordable housing subsidy that would set an individual’s rent at 30% of their income, the economics of renting an apartment become impossible for most of DRM’s clients. NLIHC released a report earlier this year [The Gap: A Shortage of Affordable Rental Homes], and estimated that Maryland could only house 35 out of every 100 extremely low income families. At least 21% of extremely low income households are headed by non-elderly persons with disabilities.